Ever since we developed our first products for Chemical Protection in 1992, we have consulted end users across the world. Today we offer a broad range of protective equipment with technically advanced features, high level of comfort and high quality. A complete kit that provides a high level of splash protection for particles, dust and moisture when working in risk environments involving for example ammonia. 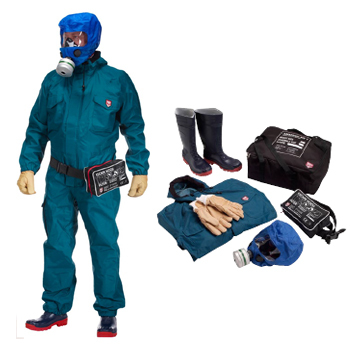 The kit consists of a protective overall, a chemical escape hood with carrying bag, insulating gloves and protective boots with steel toe caps and steel mid-soles.